Never one to do things the easy way, the Zune team came up with their own unique way to handle song organization; where each song belongs to an album, and each album belongs to one artist. But while this method of organizing enables advanced manipulation of songs, artists, and albums, its complexity can be confusing to new users who may be more familiar with a more straightforward implementation like those found in iTunes and Windows Media Player. 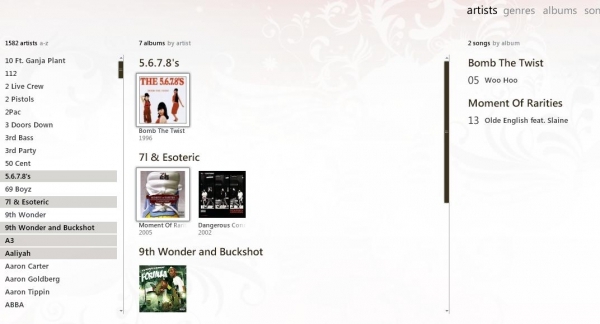 The default ("Artist") view of the Zune client app organizes your collection into a three-pane hierarchy of Artist-Album-Song, with songs being the most basic level on the right of the screen. Selecting an artist or group of artists filters the Album pane down to show only albums by those artists. Similarly, selecting an album or group of albums will only show songs from those albums in the Song pane. The advantage of organizing your collection in this way is to allow you to use artists and albums as song groups: an Album can have multiple songs each with their own genre, and an Artist can have multiple songs each with their own contributing artist. So let's say you're browsing around an artist or a group of albums and you want to return to the full list of all your songs, albums, and artists. All you have to do is click anywhere or on anything in one of the three panes and hit the Escape (Esc) key on your keyboard. In another scenario, you are looking at an artist with several albums. When you select one of them, the song field is going to narrow down to only show songs from that album. But if you want the full list of songs by that artist to show up again, place your mouse in the Album pane, and click on a background area that isn't occupied by an album (a "blank" area). This "blank area" trick works in the artist field too, but it's a little more difficult to accomplish. Hopefully now you're a little more familiar with how the Zune software operates and organizes songs. Got a tip? Post it in the forum or contact us.